We thank all participants and speakers for their contributions to a successful meeting! The 23rd Annual Meeting of the Austrian Society of Surgical Oncology (ACO-ASSO) in 2006 will focus on the diagnosis and treatment of non-small cell lung cancer. For the first time there will be a joint meeting with the Central European countries of the 11th International Thoracic Surgery Congress - Germany, Hungary, the Czech Republic, Slovakia, and Poland. Lung cancer is the most common cause of death in cancer patients in Europe, and it is the carcinoma where primary prevention plays an essential part. Over the past decade the number of female lung cancer patients has steadily increased, but on the other hand new findings in the field of molecular genetics and neoadjuvant regimens have changed diagnostic and therapeutic approaches. Interdisciplinary cooperation – surgery, pneumology, oncology and radiotherapy – is a sine qua non. Curative and palliative settings, which take a patient´s quality of life into consideration, are equally essential. In state-of-the-art and free lectures basic oncological principles, and diagnostic and therapeutic standards will be presented. All interested thoracic surgeons, pneumologists, oncologists, radiotherapists and colleagues of other fields are encouraged to actively participate in the meeting. To emphasize the importance of multidisciplinary cooperation members of all national Austrian societies involved in this specific field – in particular the Austrian Societies of Pneumology, Oncology, Radio-oncology and Surgery as well as representatives of the German Society of Thoracic Surgery, and Pneumology, the Swiss Group for Clinical Cancer Research, the European Respiratory Society and the European Society of Thoracic Surgeons - will participate. On behalf of the Austrian Society of Surgical Oncology and the International Thoracic Surgery Congress we cordially invite you to attend the meeting in St. Wolfgang in Upper Austria. 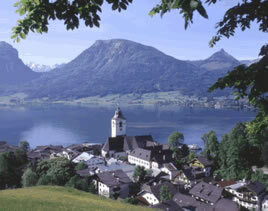 The unique location of St. Wolfgang on the Wolfgangsee (Lake Wolfgang) in the “Salzkammergut“ – situated on the border to Salzburg – and the alpine scenery provide an ideal setting for a successful scientific meeting with ample opportunity for discussions, for making new friends, and for strengthening international relationships.